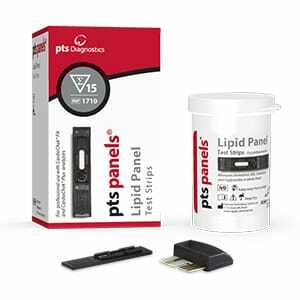 15 multi-panel lipid test strips for CardioChek PA/Plus analyzers and measure total cholesterol, HDL, and triglycerides using a single blood sample, LDL is calculated by CardioChek PA analyzer. NOT FOR USE with CardioChek analyzers. 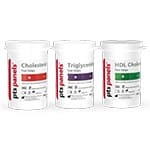 Lipid Panel Test Strips measure total cholesterol, HDL cholesterol and triglycerides in whole blood. Lipid measurements are used in the diagnosis and treatment of lipoprotein metabolism and lipid disorders (such as diabetes mellitus), atherosclerosis, and various renal and liver diseases. 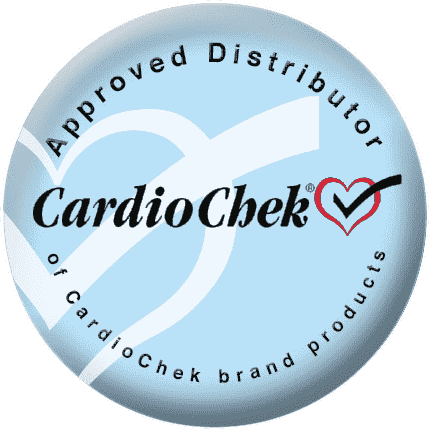 Lipid Panel Test Strips measure total cholesterol, HDL cholesterol and triglycerides in whole blood with the CardioChek PA or CardioChek Plus analyzers. A MEMo Chip™ is provided with each package of test strips and must be properly inserted into the analyzer before any test can be run. The MEMo Chip contains test name, calibration curve, lot number and test strip expiration date. After the test strip is inserted into the analyzer and blood applied to the strip, test results are displayed in about two minutes.